Montepulciano from the Colle Cave vineyard in Chieti, the vineyard above and behind the house of Gianni’s grandfather,and where his grandfather first started making wine in 1930. This steep-sloped site consists of limestone, clay and gravel, and the traditional pergola vine training is abandoned here for the French Guyot training system. 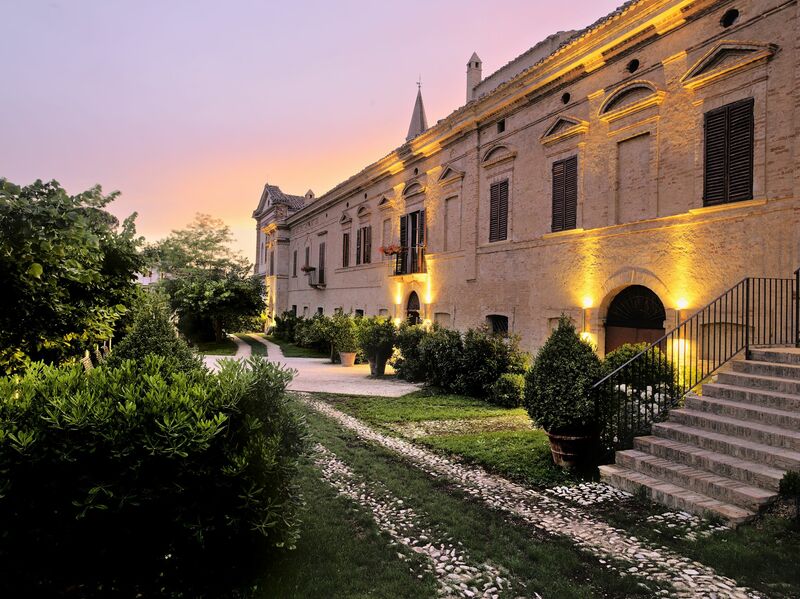 A mixture of tradition and innovation is employed for the Villa Gemma Montepulciano d’Abruzzo. First, the must is macerated and fermented in 3-5,000L botti before being transferred to new French barriques for 18-24 months and another 24- 36 months in bottle before release. A deep ruby red with purple reflections, with bouquets of intense and persistent ripe red fruits on the nose. Spices, black pepper, cocoa, licorice and dried fruits on the palate. Trebbiano is the white grape that Gianni Masciarelli fought so hard to legitimize. In Abruzzo, the specific clone is different than the high yielding, sometimes simple version of the grape found elsewhere in Italy. On Abruzzo's soils, this variety of Trebbiano creates immensely expressive, a touch opulent, and age-wort wines. Masicarelli Montepulciano d'Abruzzo is the benchmark for Montepulciano in Italy and the world. Pioneering winemaker Gianni Masciarelli, who put winemaking Abruzzo on the map, elevated the wines from his native region to new heights, and his Montepulciano d'Abruzzo is a tribute to his home as well as a perfect introduction to the grape and to Abruzzo. This wine shows how, when handled with care, the late ripening Montepulciano grape produces refined wines of soft acidity, ripe and moderate tannins, and bright red berry and cherry notes with a distinct, spicy character. Abruzzo and the Montepulciano grape are famous for making arguably the finest rose in Italy, from one of the only appellations in Italy dedicated completely to rose; Cerasuolo d'Abruzzo. This Rosato is the little sister - a fresh and totally delightful expression. The Trebbiano Riserva Marina Cvetic represents the ultimate expression for the estate of one of the historical vines of Abruzzo. Like Montepulciano, Trebbiano was once thought to be a workhorse grape without the potential to produce great wine. The interpretation of this wine is original and has a character. Marina Cvetic wines have full body and are elegant and are a “lone voice” for the most demanding and technical experts. Gianni Masciarelli one day suprised his wife by presenting her with this wine, from the grape he made famous from the region, named after her. Croatian in origin, her first reaction was that no one would be able to pronounce the wine. Because of the outstanding sites used to produce the wine and the serious winemaking care it undergoes, Marina Cvetic Montepulciano d'Abruzzo soon became the most widespread example of serious Montepluciano in the world. ISKRA is a true outlier, representing a single vineyard handled in a particular way to create a wine of extraordinary distinction and depth. While the Villa Gemma Montepulciano was the wine that announced Abruzzo to the world, the Bianco, created just a year later, further defined what the region and grapes of Abruzzo could produce. This wine, first released in 1985, speaks to the white grape varieties specific to the region and has become on of the most exciting wines produced at the estate. Perhaps the finest rosé production area in Italy, and one of the few appellations dedicated only to rosé, Cerasuolo has a long history of producing serious rosé, and showcasing how well the Montepulciano grape is adapted to rosé. Masciarelli first produced this wine in 1986, only 5 years after the winery was founded. With deep fruit and structure but no shortage of pleasure, it is a rosé you can take to the dinner table.